Time & Attendance, Scheduling, and Absence Management capabilities designed exclusively for small and medium businesses to provide exactly the functionality needed—no more, no less. Deploy the right number of people, at the right time and place, and at the right cost. We didn’t just strip down our enterprise solution. Rather we created a deployment model and template just for small and medium businesses with exactly the functionality needed—no more, no less. Should your organization grow or business requirements change in the future, your existing investment in SumTotal Workforce Management is retained as you can simply add capabilities without switching solutions or models. Increase your bottom line with full automation. Built on our Core Platform, SumTotal Workforce Management Rapid Deployment equips small and medium businesses with an offering that addresses all of your requirements for total process automation. Leverage your Workforce Management solution to remove the subjectivity from decisions. Very little managerial or administrative effort is needed to transform your workforce into a self-regulating business that positions the right people for the right job and place, and at the right cost. Navigate evolving laws impacting small and medium businesses. Preset rules means that you can have compliance peace-of-mind while staying in accordance with regulations and laws. Most small and medium businesses don’t have the resources to track and keep up with legislative changes nuanced by governments and changing labor standards. The cost of non-compliance is high and comes with great risk to your organization. With SumTotal Workforce Management Rapid Deployment, you can easily comply with changes as they come. Leverage a full Workforce Management solution or start small. Our core deployment encompasses Time & Attendance, Scheduling, and Absence Management. Want to start small? We also offer an Absence Management package that will allow you to add additional modules later. Record your employees’ time & attendance with multiple easy-to-use timesheet options. 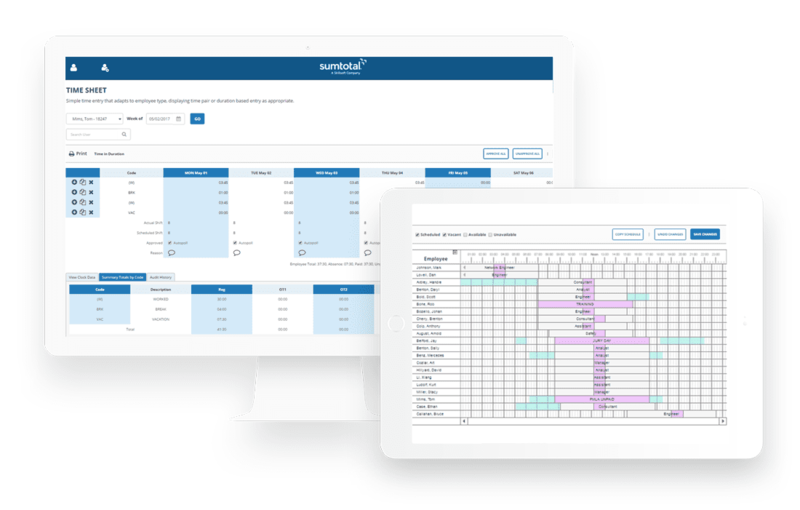 Fully integrated with Scheduling and Absence Management, Time & Attendance ensures that your employees’ time is properly recorded including overtime, shift premiums, and more. Schedule by employee, job or role and align skills to the tasks at hand to ensure the best person is assigned. From within an integrated view, make drag-and-drop changes, track availability and counts, and confirm that certifications and trainings are current. Track and record any and all time away from work. Organization-wide, salary or hourly, one solution handles it all from sick and vacation days to extended time away. End users can even submit intermittent and recurring absences in one simple request. Plus, we provide our Impulse line of data acquisition devices (time clocks) for organizations that want to track employees’ time on an on/off basis. The Impulse devices are affordable and offer a comprehensive suite of features. We understand the dynamics and pressures on small and medium businesses—in fact, small businesses are a large portion of SumTotal’s current customer base! Where other vendors instill a burdensome customer-driven deployment model, our model focuses on your success. The implementation is managed by SumTotal Subject Matter Experts (SMEs) working directly with your staff. We host a project kickoff, workshops for requirements and configurations, and hold status and inquiry meetings as part of our standard deployment. We work with your team to integrate your HR data, produce a payroll extract, ensure complete customer validation and more; plus provide ongoing go-live and early production hypercare support.